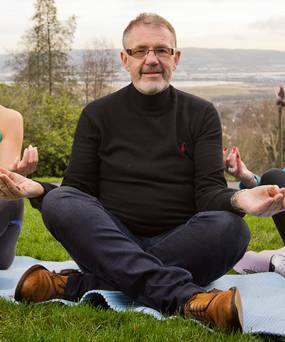 If Ireland has a "Mister Mindfulness" his name is Frank Liddy and he's based in Belfast. If you're involved in mindfulness work you won't spend long in Belfast without hearing his name. He runs the Mindfulness Belfast website along with David Cameron (no, not that one). According to the Belfast Telegraph, he is now the first Zen chaplain to Belfast City Council "his role is to provide secular advice for the Lord Mayor, and he is also a mindfulness practitioner for Aware, the Northern Ireland based depression charity." He was appointed as a local assistant to the Dalai Lama on the latter's two visits to Belfast. "My Zen teacher told me that I had two lives. When I asked when I would get my second life he told me it was when I realised that I had only one. The idea is that only when you fully realise that you have one life is when you will live it to the full." He is a member of the Black Mountain Zen Centre in Belfast. The Meditation How website has this interview with Frank Liddy about how he came to Zen via the trauma of the Troubles and his discovery of Transcendental Meditation. Oh, and it you'd like to hear the Body Scan delivered in a Belfast accent, check this out. Click for my free audios/resources and my courses.